As you can see from the above bio, Dr. Pile strongly believes in continual learning. She has averaged well over 100 hours of continuing education per year since graduation, much greater than the 30 hours required yearly. She also believes in continuing education for her team and has chosen to spend the resources of time, effort and finances on the development of each individual’s knowledge and abilities as well as her own. Under the leadership of Dr. Pile, the team has invested heavily in the behavioral aspects of healthcare as well as leading edge clinical dentistry. Dr. Pile has taken her team all over the four states for continuing education, as well as Atlanta, Las Vegas, & Costa Rica. In addition to her interest in general and cosmetic dentistry, Dr. Pile addresses “malocclusion” as it is a disease, and has a passion for orthodontics, using the INVISALIGN technology. Due to her experience, she has been recognized by Invisalign as a “Premier Preferred Provider” making her in the TOP 5 in the COUNTRY in cases treated. Dr. Pile is a member of the American Dental Association, Kansas Dental Association, the SEK District Dental Society, and the Southeast Kansas Dental Study Club. She is a firm believer in volunteerism in our community as well as organized dentistry, serving on a multitude of boards and volunteer groups, including Kansas Mission of Mercy, Free Oral Health Screenings for Kindergarten Roundup and Dental Health Month, Oakview Estates Advisory Council, Frontenac PTO, Church Altar Society, Meals on Wheels, and Coach for 3rd Grade Boys Traveling Basketball Team. She is Past President of the SEK District, as well as the Pittsburg Dental Study Club. She currently serves on the Board of Delegates for the Kansas Dental Association, representing the Southeast Kansas District, at the State Level. Dr. Jill Saia Pile married her longtime classmate and best friend, Jared, as they are blessed with 3 beautiful children: Hayden, Vinny, and Giana. In their spare time, (if any) you can usually find them on the farm tending to the cows, 7 horses, or 4 birddogs. The Pile’s are crazy about KU Sports, traveling and hunting the great outdoors. Kandi (Puryear) Hale grew up in Miami, OK graduating from Miami High School in 1985. 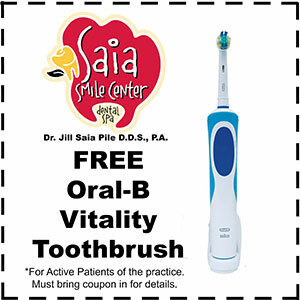 Kandi has been such a vital member to Saia Smile Center since 2007. As Treatmentment Coordinator, Kandi goes above and beyond to make every experience a positive one: whether its arranging a convenient appointment or formulating a financial plan to make your desire smile a reality, Kandi is always here to help! If you have to see a specialist, Kandi bends over backwards for you to make sure all your information is there when it’s time for your appointment. She is great at keeping our patients in an affordable budget to fit their lifestyle while achieving the best in optimal oral health. She spends countless hours on the phone with insurance companies checking benefits for the patients and presents options for them to choose from: again, way beyond what most dental offices do, especially for patients who are out of network. Her sweet voice and contagious personality are second to none, as she really gets to know our clients and their families on a very personal level. On a summer night after work, you’ll usually find Kandi and her husband, Skip, at the baseball fields cheering on their son, K.W. The couple also have two beautiful, sucessful daughters and three precious grandchildren. Fun Fact: Kandi was a “Norse Star” dance at NEO and is married to a Missouri Southern Football Hall of Famer. Connie was born in Southern California but moved to Kansas in 1984. She attended Girard Schools and graduated in 1996. Connie continued her education at PSU where she was a Biology major and was a teachers aid for Principles of Biology. Connie joined the Saia Smile Center team in 2014 and really enjoys her work family along with helping patients treatment plan their dental needs. Connie also does hair and worked for John Paul Mitchell systems as an educator when she lived in NY. Connie is a mom of four daughters with a 21 year age gap between the youngest and oldest. Connie is always on the go with her kids playing competitive travel softball and watching her daughter dance at the collegiate level. Connie enjoys traveling and crafting. Fun Fact: Connie and Dawn have a side business together called Be-you-nique Designs. Linda (Cronister) Willis was born in Pittsburg, KS. She lived in Topeka and Hiawatha for 12 years before returning to Pittsburg in 1976. She graduated from Pittsburg State University in 1978 with a Bachelor of Science Degree in Elementary Education. She was a 1978 Baccalaureate Scholar Graduate. She received a Master of Science Degree in 1982 in Elementary Teaching. She has 60 post graduate hours in continuing education with an emphasis in reading. She began teaching in the USD 250 school system in 1979. She was a classroom teacher from 1979 to 1991, Title 1 reading teacher from 1992 to 1997, Reading facilitator and Literacy Coach from 1997 to 2010. She retired after 31 years in education in 2010. She married Dan Willis in 1978 (he passed away in 2005). She has 2 sons and 1 daughter as well as 4 grandchildren and 2 step-grandchildren. She enjoys spending time with her children and grandchildren. A highlight since retiring was traveling to Italy with the Our Lady of Lourdes Choir and singing at a Papal Mass. She regularly attends the Chiefs home games and goes as often as possible to watch the Royals. Fun Fact: Linda was Dr. Jill’s third grade teacher. Dawn Elbrader was raised in Columbus, KS and graduated from Columbus Unified High School in 2006. Dawn also attended Carl Junction schools for many years prior to transferring to Columbus. Dawn joined the Saia Smile Center team in January 2014 while attending Labette Community College, where she earned her Associate Degree in Dental Assisting. Dawn has always been a country girl and enjoys the outdoors. She enjoys spending quality time with her two sons, Landyn and Eastyn and she makes her family and friends top priority in her life. As an Independent Scentsy Consultant, in her free time, Dawn enjoys sharing this wonderful product with everyone! Fun Fact: Dawn and Willie Nelson are third cousins! Kim grew up in Parsons, KS but attended and graduated Oswego High School in 2011. Kim continued her education at Labette Community College where she graduated in 2013. She continued her education at MSSU in the Dental Hygiene program where she received her degree in 2013. Kim now lives in Carthage, MO with the love of her life, Justin and his son Grant. Kim enjoys going to concerts, spending time with friends and her two dogs Daisy and Copper. Fun Fact: Kim was homecoming Queen in High School. Cindy was born in Columbus, KS but grew up in Kansas City. When she was a sophomore her family moved to Pittsburg, KS where she met her husband Jim. They married on May 16, 1981 and had two sons, Zac and Josh. They moved to Frontenac, KS in 1995. At that time Cindy started working in the dental field as an office manager for Dr. Jim Rhodes. She worked for him until his passing in 2015. Cindy came to join our team after Dr. Rhodes’ passing. She brings 20 years of dental knowledge to our practice and will be there to greet you when you walk in the door. Cindy is so grateful for the opportunity to be part of the Saia Smile Center family and hopes to be here until she retires. Cindy has one grandchild named Haiden. She is the joy of Cindy’s life. Fun Fact: Cindy belongs to Phi Tau Omega Sorority, where they do a lot of philanthropic work in the community. Kim was born and raised in Pittsburg, KS. She attended St. Mary’s Colgan schools were she graduated in 1982. Kim met and married the love of her life, Todd, in 1985. In 1987 they welcomed their son Ryan into the world. Ryan is now married to his wife Mandy and they have a beautiful little girl named Mila Jade. Kim was an assistant for Dr. Rhodes for 13 years before Dr. Rhodes passed away in 2015. Kim joined our office after Dr. Rhodes passed and loves being around our patients and making sure they are comfortable during their dental procedures. Kim loves spending time with her family and walking. Fun Fact: Kim’s nickname is Sparky in our office because of her sparkling personality. Kandi grew up in Neosho, MO and graduated in 2005. Kandi continued her education at Missouri Southern State University with her Associates in Dental Hygiene in 2012. Kandi joined the Saia Smile Center team in 2015. Her favorite part of being on the Saia Smile Center team is the people she works with and getting to know her patients. In her spare time, Kandi enjoys traveling with her husband Doug, shopping, and spending time outdoors. Fun Fact: Kandi has two cats. Princess Lexi is her favorite. Kelci grew up in Frontenac, KS were she graduated in 2012. Kelci then attended MSSU where she graduated with a Bachelors in Health Sciences and an associates degree in Dental Hygiene in 2016. Kelci joined the Saia Smile Center team right after graduating in 2016. Kelci enjoys spending time with her husband Zac and her fur babies Gus Gus (her corgi) and her cats Callie and Shadow. Fun Fact: Kelci is a huge Harry Potter fan.